The Telugu stones in English presented In this volume provide a panaramic view of the traditions. customs. convictions and the modus vivendi of the people of Andhra Pradesh. India. 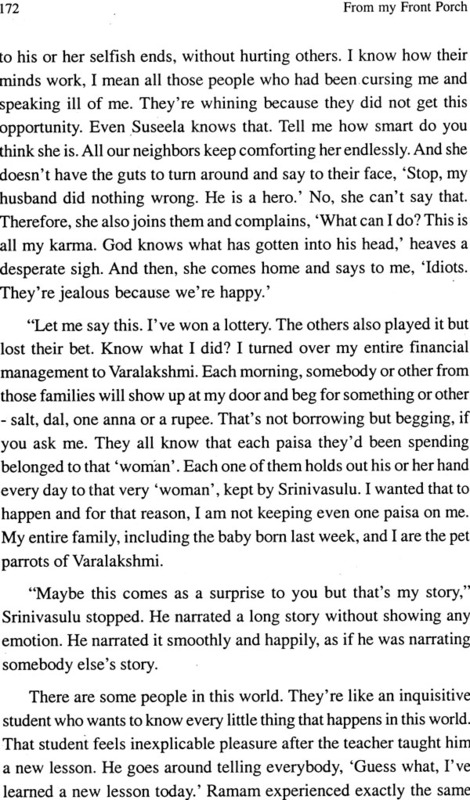 Some of the best Telugu writers give you insights into their modes of thinking about the familial. social and cultural values of our times. Each story depicts a different aspect of Telugu people's life - relationships. emotions such as fears. frustrations, rage. caring and sharing In close-knit families, and the transformation of rural lifestyles because of urbanization They tell you stories of people from royal fighters to snake-catchers, from a woman yearning for recognition as a human being to a woman who shadows her husband. from the traditional value of a human being as one entity of a man and a woman to the farmers' ingrained fondness to the hometown. Readers will find the narrative technique in these stories fascinating. Entrenched in oral tradition. these writers tell the stories in a voice that pulls you in. Notes and glossary included in the book add to the value of this anthology as a tool for students interested in cultural studies. Indian literature and Telugu literature. Malathi, Nidadavolu has been writing and publishing since early 1950. She is currently based in the U.S., and has been translating Telugu stories into English for non-heritage readers for over twenty years. Her stories. translations and critical articles are published regularly on her critically acclaimed website. www.thulika.net. since June 2001. Her stories. poems and critical article in Telugu are published regularly on https://tethulika.wordpress.com. Publications: A Spectrum of my People (Collection of translations). Telugu Women Writers. 1950-1975 (A Critical study. published in U.S. only). 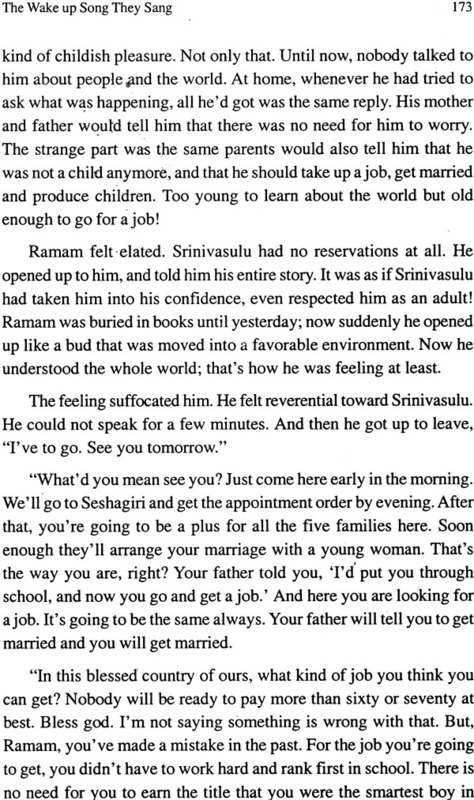 All I wanted was to Read and other stories (An anthology of Malathi's stories). and Nijaanikee and feminijaanikii madhya (Malathi's stories in Telugu). In June 2001, I launched a website, www.thulika.net, devoted to bringing Telugu fiction exclusively to non-native readers. The site became an instant success. In 2004, I presented my book (draft) on Telugu women writers, 1950-75, to a group of American readers. 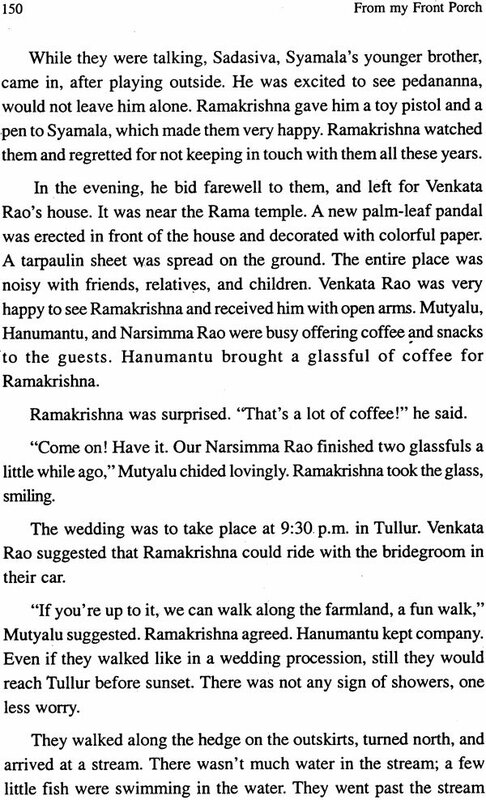 The book included synopses of a few Telugu novels. The response from the group was positive. Some of them pointed out that they could see strong parallels between the two cultures-American and Telugu- the cultural and familial values as depicted in our stories. 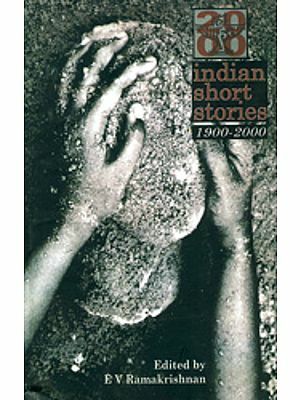 That triggered my interest in publishing an anthology of Telugu short stories in English, which hopefully could make a valuable contribution to global understanding. Generally speaking, fiction by Indian writers is prominently featured across the world both in the academy and on the Internet but Telugu literature has not received its due recognition in the general public across the world. South Asian diaspora is strewn with names of Indian writers-from R. K. Narain, V. S. Naipaul, to Bharati Mukherjee, to more recent Kamala Das, Arundhati Roy and Jhumpa Lahiri but the names of Telugu writers are conspicuous by their absence. I visited Andhra Pradesh in October 2002 and contacted about one hundred writers and they shared my sentiment. Several of our writers have emphasized that Telugu fiction is in no way inferior to any of the world literatures but sadly lacking in exposure. The purpose of this anthology is to bring Telugu fiction to the readers of other cultures, especially outside the academy. Accordingly, I attempted to present these translations in a language that is intelligible to the readers who are not familiar with Indian culture, nuance and Indian English. For the same reason, extensive annotations and glossary are also provided. In step with the observations stated above, I attempted to make this anthology a compendium of stories, filled with detailed accounts of real people - their daily challenges, struggles and solutions, picturesque accounts of their environment and personal relationships. Each story reaffirms or challenges our beliefs and raises poignant questions about our lifestyles. Each story holds a mirror to our values or beliefs from a different angle. I've been in America for over thirty years, and during this period, I spent most of my time trying to understand their attitudes and beliefs at personal level, apart from politics. I am convinced that the basic human values are the same across the world and the differences lay only in the way these values are manifested in each culture. By the same logic, human suffering is the same across the world but the differences lie in the manner in which each person responds to and deals with his or her situation. While the sociological and anthropological studies provide two-dimensional characters-just a broad outline-the individuals come alive in fiction. Authors take real people from real life and present them in a manner that makes sense for cultural interpretation. I will elaborate further on this subject later. The stories included in this anthology extend over a period of six decades from nineteen forties to the present and include male and female writers of repute, from established writers to emerging voices. My priority, nevertheless, has been themes and new insights into human nature or condition; and my objective is to choose themes that defied prevalent stereotypes and/or threw new light on a given issue, dated in some instances. In recent history of Telugu critical reviews, themes appeared to be the dominant factor, to the detriment of story-telling technique, completely at times. I however feel that both the theme and the technique of storytelling peculiar to Telugu fiction play a significant role in capturing the readers' curiosity and defining the cultural nuance. This is particularly important for global audience who read stories of other cultures as much for the story value as cultural nuance. In terms of themes, the stories in this selection present a broad spectrum of umpteen human conditions and emotions at various economic and sociological strata in Andhra Pradesh. They highlight not only the disparities in material possessions but also the dissimilarities in the protagonists' mode of thinking or action. I tried to present the rich diversity in the topics and perspectives of our cultural and familial values, and the basic human psyche that transcends the geographical and cultural bounds. They range from middle class lifestyles with their aspirations and daily struggles, emotional and physical concepts like anger and hunger, to economic, communal and family values. In terms of technique, the stories feature several angles-from linear to concentric or eccentric. Broadly speaking, in a linear narrative, the narrator opens with a statement, lets the story unfold gradually and progressively in a series of incidents, and then, brings to a believable or thought -provoking closure. In a concentric narrative, the story opens with the crux of the problem and unfolds moving outwardly. In an eccentric style, the story is narrated in several layers. This style is often laden heavily with the elements of oral tradition. I am not implying that each story falls invariably into one or the other of these groups as such but I would like to point out that traces of these characteristics may be noticeable in these stories in one form or another. The stories depict different aspects of themes-religious/ philosophical, women's perceptions and women's status in society, and people from lower strata of the society. The story, "The Soul Wills It", projects man and woman as one entity as per Hindu beliefs. Most of the stories in this anthology are multilayered and open for several interpretations. The "Violation" is a story of proprietors of mango groves cheating the daylaborers of their daily wages; and, on another level, the story also depicts the status of women in society. This is just one example. Further discussion to follow. - And, the regressive elements as manifested in our self-styled progress in today's Andhra Pradesh. These elements are neither mutually exclusive nor airtight. Each story is imbued with several layers and perceptions in an intricate web of contiguity. For that reason, organizing the titles in this book has been a challenge. Nevertheless, it was necessary for the physical . layout, and so I tried to create some artificial sequence for the purpose. It moves loosely from time-honored beliefs and customs, to pride in one's community and calling, and then to the changes brought about in urbanization of the rural areas, women's perceptions and issues, and to the injustices in society. 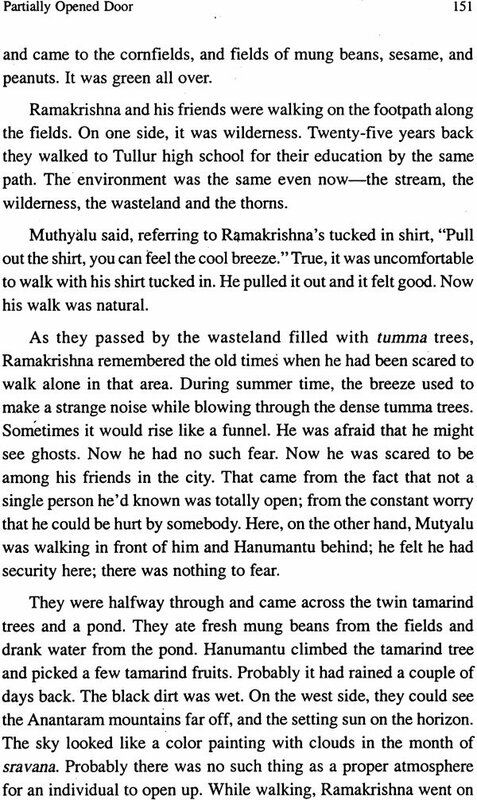 Each story projects some general idea and/or a point of view- the traditional belief of man and woman as one entity (Viswanatha Satyanarayana: "The Soul Wills It"); the metamorphosed sense of sovereignty and the life of the underlings in their lost cause (Munipalle Raju. "The Royal Fighter"); the newly emerging conflicts of rural life in the face of overwhelming urbanization (Ramana Reddy. "Railway Signal Post". Sivasankar. "Partially Opened Door". ), the indomitable human spirit up against natural disasters (Dakshinamurthy. "Glowing Moonlight"). From a woman's perspective, a few stories present varying angles of women's position in society: The early signs of awareness of one's identity in women (Saraladevi. "Long Awaited Moment"). The story, "The Charm of a Cherished Story" (Varalakshmamma) stands out as a separate category. The story is illustrative of women in middle class families; women who were in a position to freely express their views, even when it meant criticizing their husbands. Additionally, the author notes her perceptions of the literary atmosphere in her day-the shallowness among male writers and their critiquing practices. Ironically, things have not changed much in the past sixty years.